I definitely need more practice drawing action scenes. And we are just not going to talk about hands. Remember those good old days when I just stuffed hands behind speech bubbles as much as possible? I miss those days. Will put a new vote incentive up this weekend – next on the list… Ila! New job starts on Monday; if everything goes to plan I’ll have next weeks comics done before then; so at very least next weeks should be on track normally and we’ll see how much drawing I fit in during the week for the week after. I’m trying to move to a bit more of a streamlined art process. We’ll see how it goes, I’m guessing there will be a lot of little attempts to figure out how stuff more drawing time into smaller boxes. I’m scared. Naomi is smiling and hitting stuff…I’m very scared. You show great wisdom… great wisdom indeed! This instinct would have saved many over the years, alas, great wisdom is hard to come by! I suspect Kally is in for a lesson her self. Did Kally undo her alterations of the ball on the sly? Or did Naomi just get so into it she exploded the ball despite those changes? I did want to show a little more about it – when Kally originally changed the ball she made it a lot less flexible; when Naomi hit the first time, she crushed it but it didn’t break. When she hit again here the ball wasn’t malleable enough to get crushed again and ripped to pieces. Kally’s magic doesn’t really provide the same level of impact – changing the acceleration puts some strain on it (which is why she doesn’t make it super brittle – if she could) but compared to Naomi who imparts velocity by using more conventional physics (if, ah, helped along) in a single crushing impact, she’s far less likely to break the ball even when it’s messed up. Observation: We have not seen Peter use magic often. (Have we seen him use it at all?) In contrast, we see Kally use it quite often. And she’s obviously very talented at it. Question: Does Peter have magic or Autocaster ability worth mentioning? Granted, Peter clearly has a sharp mind and knows how to use it. And he seems to be exceptional at certain skills, like computer security/hacking. Both his mind and skills would make him a valued asset of IDS. But, Kally used to be Peter’s partner back then. I think it would be weird if Peter would be more-or-less defenseless without support from allies, while his former partner Kally is so strong. I get the impression that Peter may have appreciable magic or Autocaster skills that, for some reason, he does not use unless absolutely necessary. Perhaps he just wants to avoid conflict or use others whenever possible? Peter isn’t skilled at magic or autocaster use. According to @PastUtopia when he and Kally were monster hunting together for IDS, he’d figure out where the targets were, and Kally would take them out. It sounded rather like the relationship between a police detective and the S.W.A.T. team. One clarification… Kally was a ‘monster hunter’ (Situation Containment branch) before working with Peter. She worked with Peter in Criminal Investigations. This is all not things were ever really covered though yet though… so… no marks off 😛 The reason behind her transfer will be covered at some point, but she outguns the vast majority of CI branch people, but she can’t exactly use some of her top shelf stuff in most situations – Peter noted way back during the robots dropping on the school is the only reason she’d have worry was that was in the middle of a school. As @Deltva-v notes, Peter was more like a detective or investigator, Kally was cavalry. While Peter has a reckless disregard for danger and remarkable ability to stay alive, he’s not as much good for subduing dangerous marks in a traditional sense. Peter certainly can use an autocaster; the typical weakness of people that aren’t as good at combat is primarily speed more then anything, though range, power and complexity are also factors. The only time we’ve seen Peter consider magic it’s clear that he has a general autocaster that’s capable of loading new spells on the fly with some help – this alone is fairly impressive from a tech point of view, and using it isn’t trivial; but in combat it’s fair less useful. Peter originally was a computer specialized that started operating in the field for reasons we haven’t entirely heard yet. Kally was originally a monster hunter that transferred to criminal investigations for reasons we haven’t entirely heard yet; though they ended up in same place, they came from very different directions, and that’s part of why they made such a good team. The expressions on this page are priceless. Naomi’s little embarrassed blush in panel 6 is a nice touch, and Kally seems to be starting to enjoy herself. They will probably both learn a little something here – Naomi knows the sport pretty well, but there just aren’t going to be that many mages on Kally’s level playing in leagues Naomi is familiar with. 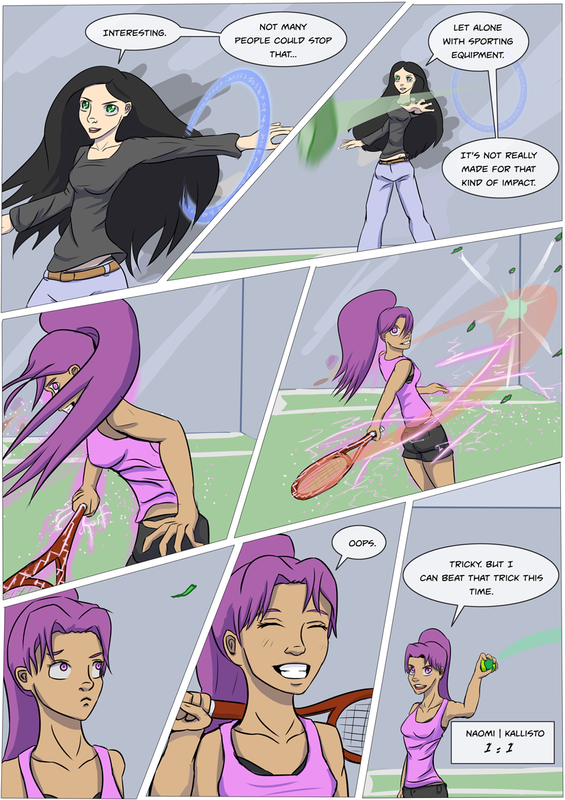 Kally isn’t familiar with the sport or what Naomi can do, but has some reason to her confidence in a contest of magic, but she already lost a point by being slightly overconfident. Plus, Kally may not be super friendly at the best most of times, but she’s not immune to enjoying a challenge.